vCard converter tool import multiple vCard files to Outlook contacts and supports batch processing of VCF file. This feature allows to convert vCard at one go without any complexity and hindrance congruently. A vCard to Outlook converter allows users to perform bulk import vCard to Outlook contacts regardless of the version of vCard files. vCard converter software will export any version (2.1, 3.0 and so on) of vCard file to Outlook contacts. A user can easily save vCard from email to Outlook contacts that too in any user account. Also, the user can import vCard to any Outlook.com or Exchange server etc. account according to the choice. vCard converter Software offers a simple and self-explanatory user interface for the ease of our user to import vCard file into Outlook smoothly and in an uncomplicated manner. Anyone can perform conversion effortlessly as it does not require technical expertise. Hence, a novice user can easily perform export VCF file to Outlook procedure without any problem. While converting vCard to Outlook, all necessary data like email Ids, contact number, addresses etc associated with VCF file are also imported. All meta properties stored in the file are kept intact after successfully saving vCard in Outlook. vCard is also known as Virtual Contact File, is an electronic business card which is often attached to an email message. This vCard consists of information like email-address, telephone number, address information etc. The file format supported by vCard is VCF which can easily be shared over the internet or via simple messages. vCard is helpful to move contact information from one email (or personal information management program) to another. But the conditions are that both the platform must support VCF file format. If a user needs to convert his vCard files to Outlook contacts then, Intrigua Convert vCard is the best choice. The tool is appropriate for importing multiple VCF files to Outlook contacts without bothering about the version of the files. The utility does a wonderful job of maintaining the integrity and folder structure of VCF files after conversion. 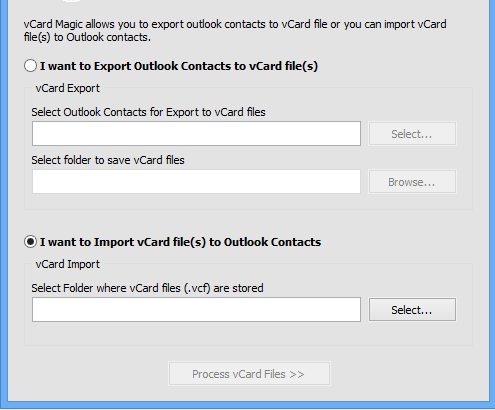 Step 1: Launch the utility and Select I want to Import vCard file(s) to Outlook Contacts. 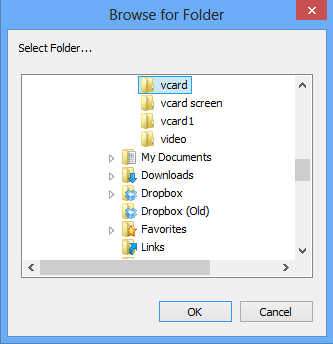 Step 2: Browse for folder that contain vCard files. Click ok after selecting folder. Step 3: Software will ask you to select Outlook contact folder to import vCard files. 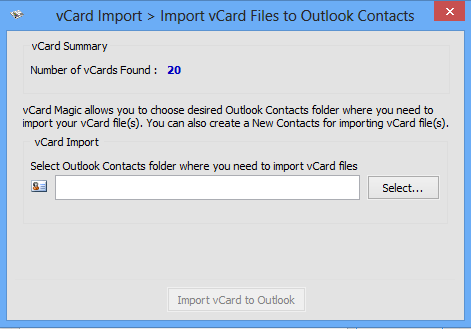 Step 4: Select contact folder and click Import vCard to Outlook button. View following software working video in just one click that is being prepared for our user. Get overall idea of how to import multiple vCard files to Outlook contacts from this interactive video. Does convert vCard software support latest version of windows OS? Yes. Convert vCard tool support the latest version of windows that is windows 10 and software doesn't have compatibility issue with any version of windows OS. Can I import large number of vCard files into Outlook at one go? Yes. 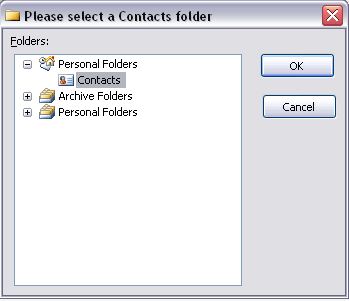 You can import multiple or large number of vCard files to Outlook contacts and that too at one go. Is it necessary to have MS Outlook installed on my system to import vCard file? Yes. You must have MS Outlook installed on system to import vCard files to MS Outlook contacts folders directly. What is the limit of trial version to add vcarda to Outlook address book? Trial version has some limitation as it can convert only first 5 vCard file to Outlook contacts. Intrigua Export vCard to Outlook contacts is an amazing tool that literally saved my day. The support team was also really helpful and was beside me throughout the installation procedure. It is a worth buying utility. I am really impressed with the functionality of the tool as it provides results in just a couple of minutes. Thank You for this software. Among many software available in the market, this Intrigua’s vCard file converter software is the only utility that lived up-to my expectations. The software does a wonderful job in exporting multiple vCard files at the same time. Also, the data integrity is maintained with intact folder structure. The best tool for even a novice user for performing vCard to Outlook conversion. Big Thank you to the entire team of this utility.